If you’ve never made a pincushion before, you’ll want to keep reading. This project is great for using up scrap fabrics and for dipping your toes into fusible web appliqué. It doesn’t take long to make at all, so it’s a perfect “gotta have it done in an hour” gift. If you have never tried this easy form of appliqué and want complete instructions on how to do it, you’ll definitely want to check out my course, Fusible Web Appliqué Essentials. It goes step-by-step through the whole process of making a fusible web appliqué project. (Or join The Quilter’s Way where this course is included free with your membership). Once you’ve assembled all your materials, starch the two charm squares so they are stiff. This makes them easier to work with. Fuse or glue the appliqué to the top charm square. Finish the appliqué edges by stitching with your chosen stitch. I like to use a narrow zigzag. Note: You might need a fabric stabilizer underneath the fabric, depending on the denseness of the stitch you have selected. Place the top and back charm squares right sides together and stitch around them with a ¼” seam, leaving an opening on one side to turn. Clip the corners and turn it right side out, poking out the corners (I like to use That Purple Thang to do this). Stuff with Polyfil or similar stuffing until very firm. Hand stitch the opening closed. If you like the look of your pincushion just as it is, you can stop here, but if you want to give it a bit more definition, read on. To give it a pincushion shape, I like to stitch through the centre of the pincushion and out the back several ties, pulling the thread taut each time. Use two lengths of perle cotton for this (a regular weight thread might break - ask me how I know!). Knot the thread and starting on the back, push the needle through to the top. Take a small stitch and then go back down to the back, pulling the thread taut. You could add a button on top while doing this if you wished. Do this 3 times and then knot the thread in the back. Your pincushion is now done! 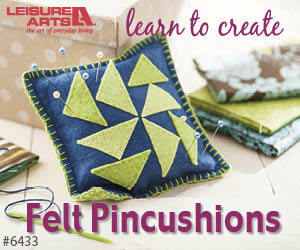 For a complete step-by-step tutorial on creating this pincushion, click on the image below. Have you ever made a pincushion before? Share your ideas and experiences in the Comments below. Do you buy quilt kits? Many quilters absolutely love picking up kits, while others don’t like them at all. There are advantages and disadvantages to quilt kits, so let’s explore these. If you’re a beginner quilter, you may not have much confidence in putting fabrics together. You may just be starting to develop your colour sense and kits can help you with this. All of the fabrics are already chosen for you and you can be sure that they will all work well together. Fabrics selected for a kit can help you learn how to put various colours and fabrics together effectively. If you are working on a pattern that requires a lot of different fabrics, but only a small amount of each of them, kits can be a real money-saver. 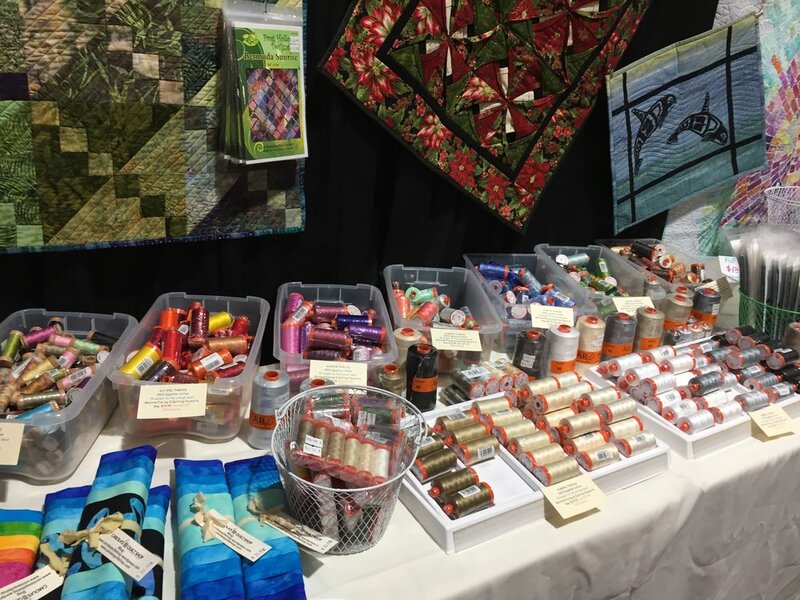 Take a look at any patterns by McKenna Ryan or Toni Whitney and you will see that there are a lot of fabrics needed to make any of their projects. Yes, you could buy all of the different fabrics, but it would probably cost you quite a bit more money than purchasing a kit as you can’t typically buy a very tiny piece of fabric. As all of the fabrics for the pattern are already selected for you, you don’t need to spend time choosing fabrics at the quilt store or from your stash. Of course, that cuts down on some of the fun of browsing through a quilt shop, but you could be making progress on the project with the saved time. 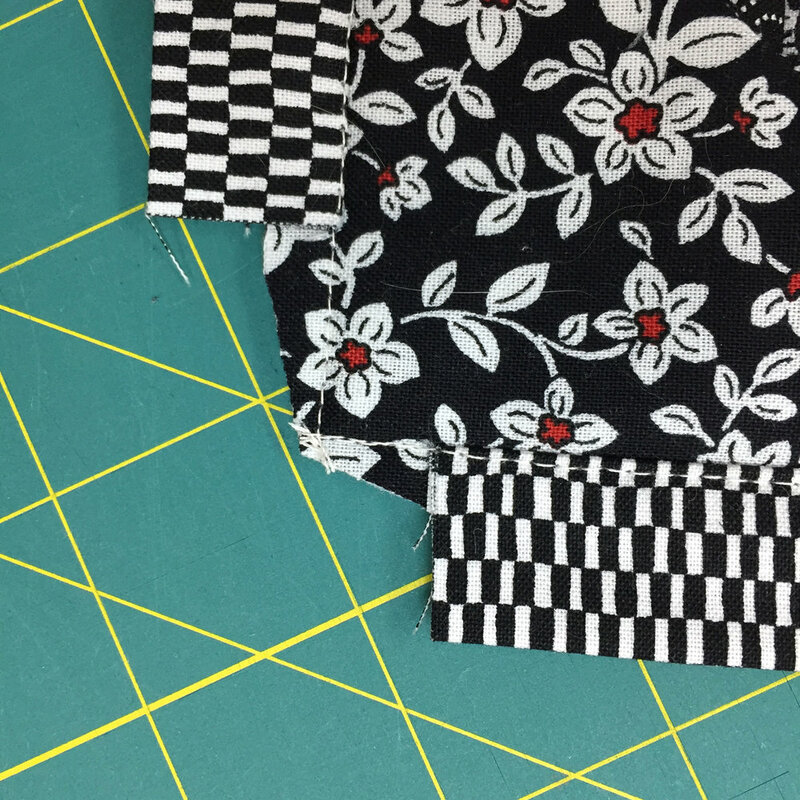 Kits are either created by the fabric manufacturer or the quilt shop and depending on whether or not they took mis-cuts into account when cutting the various fabrics, you might find that you are in trouble if you cut a piece incorrectly. It can be difficult to replace a fabric in a kit if you need to do so. Typically kits are mass produced and all contain the same fabrics so your project will look the same as anyone else’s who bought that kit. Sometimes there may be more than one colourway in a kit, but this isn’t typical. If you want to have a totally unique project, kits might not be your best choice. Since you haven’t chosen the fabric yourself, it can be difficult to determine the quality and quantity of the fabrics in a kit. If you are choosing a kit in a quilt shop, I suggest that you ask the staff to open it up so you can check on the fabric quality and quantity. This can be difficult to do if you are purchasing it from an online source. Check the return policy on kits in case you aren’t satisfied with the quality of the fabric or the amount included. You’ll also want to check out the pattern included to ensure that the instructions are clear and complete. I always check out patterns before purchasing them – in a kit or separately. For more information on whether or not quilt kits might be for you, click on the image below. If you are considering buying a kit, keep these points in mind and it will help to ensure that you aren’t disappointed in your purchase. I hate to bind my quilts. If you have been following me for awhile, you’ve probably heard me say this once or twice (at least!). I recently found a method to use facing on a quilt, rather than binding. Robbi Joy Eklow had a blogpost on this and I tried it and have used it on several projects so far with great results. it’s also a great way to use up leftover binding strips. The facing strips are 2½”, so leftover binding strips work perfectly. It’s a great way to use up scrap fabric. The facing strips don’t have to be all the same fabric, so you can use up lots of your scraps using this method. You can even stitch scrap fabric strips together to get the facing strip length that you need. This method saves time. The facing strips don’t go all the way around the quilt edge, so there is less hand sewing to do. Yes!! This is the perfect way to finish your quilt edges when you don’t want the “frame” that binding creates. This method automatically creates hanging corners so you don’t need to add a hanging sleeve. With so many advantages, I know you’re going to want to try out this technique so let’s find out how to face a quilt. 2½” strips of fabric that are the length of each of the project sides, less 2”. You can cut the strips in advance or cut them as you stitch along. The fabric doesn’t have to match for the 4 strips nor does it have to coordinate with the project front as you won’t see the facing. 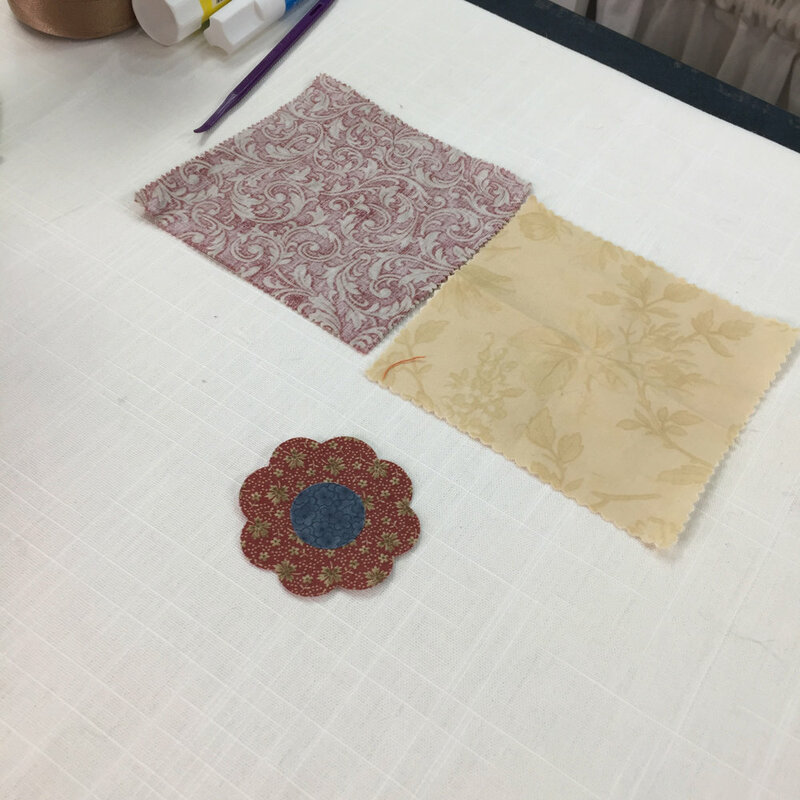 Prepare this fabric as you would for a binding – fold it in half and press. 4 – 3” or 4” squares of fabric for the corners. You might see this fabric a bit on the front, so use the same fabric for all the squares. Fold the squares on the diagonal to form triangles, wrong sides together, and press. At one corner on the top of the quilt, match the raw edges of the folded fabric square with the raw edges of the project. Pin in place. Repeat for the other corners. Starting on one side of the project, pin a 2 ½” strip about 1” in from the corner on the front of the project. The strip should cover part of the folded fabric square. Start at the quilt’s edge and stitch the facing strip using a ¼” seam. Cut the facing strip about 1” from the corner (if you haven’t already cut it to size), covering part of the next folded fabric square. Continue stitching to the corner. Stop stitching and break thread. Continue adding the 2½” facing strips on all of the other sides, starting the strip about 1” in from the corner and ending it 1” in from the far corner. Be sure that the 2½” facing strips cover part of the folded fabric squares (now triangles) in each corner. Once all of the 2½” facing strips have been sewn on, go back to where the stitching crosses each other in the corners and stitch diagonally through this juncture a few times to reinforce the stitching. Now it’s time to do some ironing. Using steam, press the facing strips out towards the edge of the quilt project. They will be heading over to the back side of the quilt, so be sure to press them well. To help ease these strips towards the back of the quilt, you can top stitch the facing strips. Stitch a scant ¼” in from the seam line on the facing strips. Moving your needle position over so that you are stitching a scant ¼” inch will help. Next, trim off the excess fabric towards the corners. There is quite a bit of bulk with this method, so trimming off the corner fabric will help. Starting at the end of one of the facing strips, angle your scissors towards the corner and cut off the fabric, batting, etc. Be sure you don’t clip through that diagonal stitching you did at each corner! Let’s get those facing strips to the back where they belong! Use your iron and plenty of steam to press the facing strips to the back of the quilt. You can gently pull on the facing strips as you press to help. If some of the quilt top shows on the back, that’s okay. You just don’t want the facing strips to show on the front. Once you have them all pressed to the back, you can flip the folded fabric squares to the back too. Press out the corners with a blunt object – I like to use That Purple Thang to do this. You now have a perfectly faced quilt project and the folded fabric squares can be used to hang the project. The final step is to hand stitch the facing strips to the quilt (yes, there is still some hand stitching to be done with this method), but if you don’t get to this right away, no worries as there aren’t any raw edges that might fray to worry about. For a step-by-step tutorial on this technique, click the image below.